Perforated 11½, no watermark, handstamped. Printed by Daniel Johannes Esselen in Vryheid. All issue quantities are approximate. The quantities of the second and third issues are unknown since no records exist. Only Scott #1A / Stanley Gibbons #1 is printed in black, all others in violet. We owe a debt of gratitude to Mr. Rick Turner of the Transvaal Study Circle for dramatically improving our knowledge of these interesting stamps. Mr. Turner commented, among a lot of other things, that "Also - interestingly - nobody has ever seen a used copy of the 1d black on yellow paper stamp." The first stamp issued in New Republic is, as often is the case, a matter of some dispute. The stamps printed first are actually not postage stamps, but more a kind of revenue stamps. They were used on all kinds of official documents as a receipt for a paid fee. The first postage stamps are thus the stamps issued on January 9, 1886. The above mentioned one penny black was supposedly from the first printing. The color of the ink used was, except for the first printing of the one penny, in various shades of violet or purple. From light to dark, and at times with a reddish tone. No other colors were genuinely used. The stamps of New Republic were only valid locally. Anything sent outside of New Republic was also franked with the stamps of the transmitting state - mostly Natal, sometimes Cape of Good Hope. The Granite paper was imported from Germany by Davis & Son in Pietermaritzburg, Natal. Granite paper is paper filled with minute cloth or colored fibers. It is not the same as silk paper. Granite paper has also been used by Austria and Switzerland. Stanley Gibbons call it blue, Scott call it gray in color. The yellow paper was possibly obtained locally (in the Transvaal?) but no records survive. However, there was no local papermaking industry in this area at the time, so the paper would have had to have been imported from Europe. About two to three times more stamps are printed on yellow paper than on granite paper, on average. This is not necessarily true for all face values. The paper was line perforated 12 locally. Due to the low quality of the paper it shrunk after being perforated. Therefore most stamps measure only 11½. Stamps are often found imperforate on one or more sides, as oversize stamps were cut down and single stamps routinely cut out of a sheet. Embossing with the Coat of Arms of the New Republic was done from early on. The first date known with embossing is 20 JAN 86, on granite paper. The number of stamps with embossing is smaller than the number without in the first issue. The second issue, without date, is mostly found with embossing. A mixture of values were printed on a single sheet of paper, so you get different values randomly juxtaposed. They were printed when required on paper already gummed and perforated, each printing including in its design the date on which it was prepared. The "parallel motion hand press" was not large enough to reach more than about 60% of the way across the sheet, so the paper had to be turned around to print the remaining stamps, hence the occurrence of tete-beche pairs, and larger blocks with mixed orientations. The number of stamps in a sheet varied, up to a maximum of 180. There is evidence that smaller sheets also existed. It is possible that the sheets of yellow paper were larger than the sheets of granite paper. Due to the primitive production method you may find these stamps in a large number of varieties, in the sense of different sizes of the stamp, and with one or more sides imperforate. Large stamps were often cut out of the sheet with scissors, and narrow copies may be missing both the left and right frame of th design. The variations have no impact on the value of these stamps, since they are common to the point of "the normal case is that they are all different". Double prints exist, some of them quite exaggerated, like when the second imprint is turned maybe 45 degrees to the first one. Not all dates are found on all the values! The stamps listed above are also found with several other dates. These are just the earliest stamps issued. For example, you may also find Scott #25 with the dates 7 MAR 86, 29 APL 86 and others. Incidentally, Scott #25 is the only stamp on which you will find the date 29 APL 86. A total of 5,295 copies of Scott #1 and 5,299 copies of Scott #2 were ordered and / or printed. 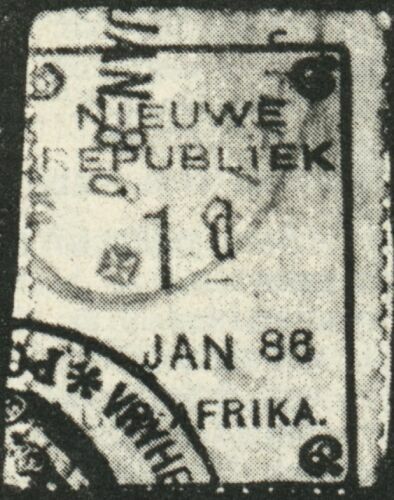 The first "E" of "REPUBLIEK" has a seriph, or sliver. The second "E" of "REPUBLIEK" has a bevelled lower extremity. The left frame is curved. 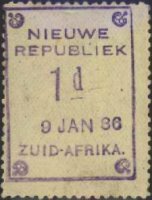 There's a period after "ZUID-AFRIKA". This seriph, or splinter, has been worn as more and more printings were made (24 in case of the Scott #1), but is still visible in the last printing of Scott #1, dated "17 JAN 87". Mr. Rick Turner also increased our knowledge with respect to forgeries of these stamps. Mr. Turner states: "Beware of forgeries - there are some good ones around! (Mostly due to our friend Fournier) as well as some that will never ever be mistaken for the real thing. Incidentally, dates are not a good indication of genuineness." One big problem is that the remainder of the genuine paper was used to produce forgeries. Do you think you can tell the difference now? You may consult David Olson's articles on the stamps of New Republic in First Issues, vol. 11 no. 1 page 8 and vol. 1 no. 5 page 1, for much more information on these interesting stamps.